Last month I was approached by Beth Behrs (the Blonde actress from the U.S award winning sitcom 2 Broke Girls) asking me to illustrate an in-house joke for her to give as a gift to fellow colleagues that also starred in the theatre staged show ‘A Funny Thing Happened on the Way to the Gynecologic Oncology Unit’. 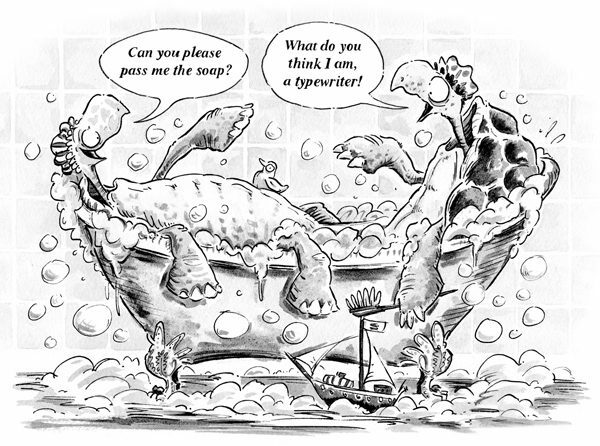 She wanted two humorous turtles bathing with the pun attached. She was delighted with the result; it’s always a relief when a celebrity is satisfied. She also found me through Hire an Illustrator… so celebs do have a peek around these parts.